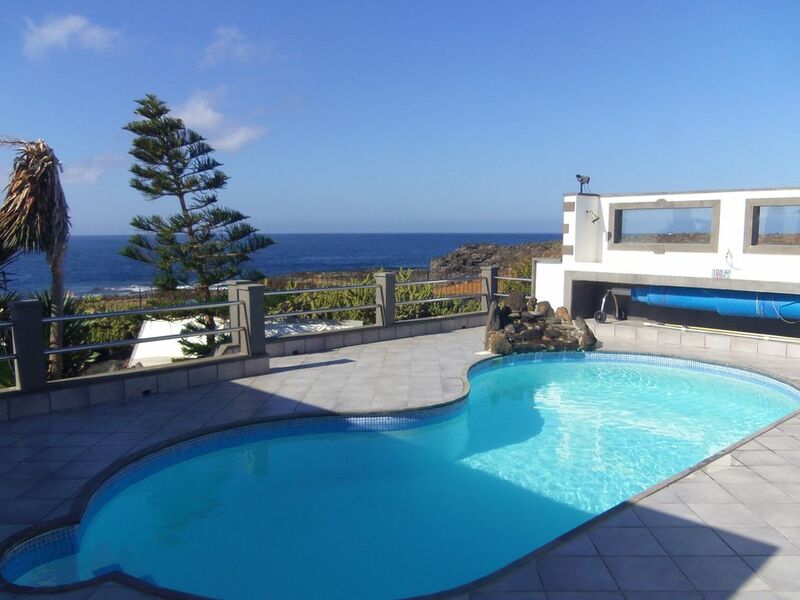 Finisterre , Playa Blanca, Yaiza Lanzarote, Canary Islands - This Fabulous Villa has Uninterrupted Ocean Views, Telescope for Dolphin Watching! This fabulous Luxury villa situated in Playa Blanca has uninterrupted views overlooking the ocean. All sea views are enjoyed from the swimming pool, jacuzzi, sun terrace, lounge, dining room and master bedroom. There is a large jacuzzi for you to relax in next to the private solar/electrically heated pool with relaxing waterfall feature. Dine and enjoy a glass of wine either in the large alfresco area or on top of the property where there is a large sun terrace with amazing panoramic views. You can even go fishing on your very own doorstep. It is a short walk to the local shops and restaurants. If you feel more energetic you can walk along the promenade through one of the towns harbours and into Playa Blanca Main town where you can enjoy the many restaurants, shops and the night life that are available. Also here you can book various activities such as jet skiing, fishing and scuba diving. Hi my name is Rhonda and I have lived with my husband in Lanzarote for the last 10 years. We take pride in the villas that we rent out and are always on hand should a visitor staying in one of our villas need any assitance. En-suite bathroom to bedroom one with bath/shower, wc, basin and bidet. Shared 2nd bathroom with shower, wc and basin. This villa has a large and light open planned lounge/dining area beautifully decorated and boast amazing views. The lounge has a 32' flat screen TV with satellite freeview and DVD player. Also a Bang and Olufsen wall mounted CD/tape/radio stereo system. Cooker, hob, fridge, freezer, microwave, dishwasher and washing machine. There are two 18 hole golf courses in Lanzarote. The first is approximately 15mins drive located near the town of Tias, The second 30 mins drive and is in Costa Tiguise. Notes on accommodation: We have joint coin operated air-conditioning / heating / dehumidifier in the lounge area and the master bedroom. The two twin bedrooms have fans. We provide a cot, highchair and bed-guard. There is a hire service for anything else you might require. Outside: Large Alfresco area with large table, 6 cushioned chairs. Well maintained garden, private heated swimming pool with relaxing waterfall feature, Sun loungers and umbrellas, large jucuzzi, pool side shower and BBQ. There is a spacious sun terrace with panoramic views, sun loungers. Private gated drive for off road parking, rear gate leading to coast for walks and fishing. Amazing panoramic ocean views across to Fuerteventura. Cleaning / Towels / Linen: Towels and linen are provided. We do supply beach towels. The towels and linen are changed at the end of every week and if required we will also clean the villa. Other: There is an area occupied by a telescope which can be used for Dolphin watching or observing the coast of Fuerteventura. Wonderful villa which exceeded all our expectations. Generous welcome pack on arrival which was much appreciated - thank you. Wonderfully situated property which offers very quiet and relaxing surroundings with amazing sea views and sunsets. However you are also still with walking distances of several restaurants and bars. We also enjoyed long coastal walks. We definitely hope to stay again. Thank you for your review and thank you for leaving the villa clean and tidy. We are pleased you enjoyed your stay and look forward to seeing you next year. a lovely villa,the perfect location the view is to die for.a few problems on arrival but all sorted straight away.a car is needed to go to larger supermarkets,if you want to unwind and relax this is the villa to choose,will be re booking. Super Haus mit atemberaubendem Meerblick. The beautiful coast is on your doorstep, just step out the back garden. Flamingo bay is the closest family beach approx 20 mins walk / 2 mins drive .Its white sands, sun loungers, umbrellas and child friendly breakwater construction allow activities such as swimming and snorkelling and is a holiday makers paradise. Papagayo beach is also a must see. Its approx 5-10 mins drive through its protected national park, It boasts many sandy coves and all the water activities you could wish for. The only airport on the island is Arrecife which is situated in the capital. It is approximately 30mins drive to the villa and taxis are readily available. The town of Playa Blanca has a port where you can catch the ferry to Fuerteventura twice a day. We would recommend you hire a car for convenience and to enjoy the sights further abroad but this is not essential for your stay.There is a new bus system with the nearest stop a 5 min walk away. There are various attractions in Lanzarote. The Fire Mountains of Timanfaya, The Cesar Manrique Museum, Mirador del Rio and many more. There is an information pamphlet in the villa with all the places that are of interest. There are 2 minimarts within 5 minutes walk of the villa plus pubs and restaurants. For larger supermarkets and shops, banks etc Playa Blanca town centre is only 5 minutes by car or bus. Booking Notes: We require 50% deposit to secure booking with the balance 8 weeks before departure. Our booking procedure is by email or telephone. Changeover Day: We are flexible on arrival and departure dates. All bookings are made on a first come first served basis. Notes on prices: Easter, Christmas & New Years are priced at £1250.00/ week. All prices are based on 4 sharing and every addittional person will be £75.00/ week. Prices for the property are in UK pounds. Last minute discounts and specific length stays are available.